I Must Garden Deer Repellent offers superior year-round protection against deer damage. 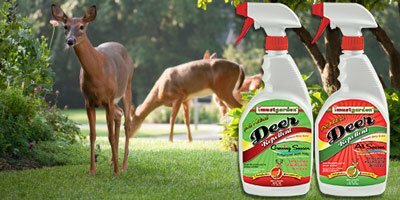 While totally harmless to deer, our deer repellent will keep deer from eating flowers, plants, shrubs and more. I Must Garden Deer Repellents are safe for people, pets, and the environment when used as directed. The Spice Scent Deer Repellent has a fresh cinnamon-clove smell that gardeners love and provides effective year round control against deer damage. As with the Mint Scent repellent, clove and cinnamon oils have insecticidal, as well as repelling properties. Cinnamon oil also has anti-fungal properties. While the botanical oils used in the I Must Garden Deer Repellents are chosen for maximum effectiveness against deer, it’s nice to know there are other benefits. No matter which repellent you use, it’s good to know that there are no poisons, harmful chemicals or toxic glues in our products. All of our repellents are safer to use around children and pets, and are completely biodegradable and environmental friendly. I've tried everything! Made many concoctions myself too but I have to say I Must Garden Spice Scent is the best sauce I've ever used. Easy to use (so much easier than the stuff I made, YUK!) and it seems to last a month or so. Thank you, THANK YOU!